Expression pattern of the bacterial genome is determined by controlled distribution of a limited number of RNA polymerase, the enzyme for DNA transcription, among an excess number of the genes on its genome. The gene selectivity of RNA polymerase is regulated by two groups of the regulatory protein, ‘sigma factors’ with the promoter recognition activity and ‘transcription factors’ with the modulation activity of RNA polymerase functions. 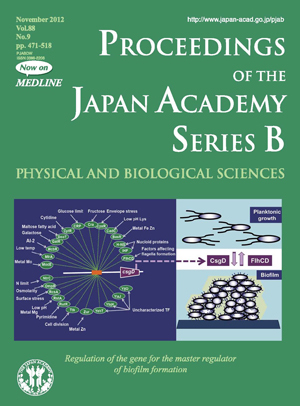 Dr. Ishihama has long been concerned with the molecular assembly and functional modulation of RNA polymerase in Escherichia coli, the model organism of molecular biology. For identification of the regulation targets by two groups of the regulatory proteins, Ishihama lab developed the Genomic SELEX and the PS-TF (promoter-specific transcription factor) screening systems. With these newly developed experimental systems in hand, they have achieved comprehensive survey of the regulation targets for all 7 sigma factors and all 300 transcription factors from E. coli. Their findings altogether raised a hitherto unexpected finding that multiple transcription factors are involved in regulation of the majority of E. coli promoters, and force to renew our current understanding of the simple regulation mode of prokaryotic transcription. The cover illustration shows the repertoire of transcription factors that are involved in regulation of the promoter for the csgD gene encoding the master regulator of biofilm formation and the flhCD genes encoding the master regulator for flagella formatin. Under stressful conditions in nature, bacteria survive by forming biofilm. The switching between single-cell planktonic growth and biofilm formation is controlled by the two global regulators, CsgD and FlhCD. The csgD promoter is under the direct control of as many as 30 transcription factors, each monitoring a different environmental condition.